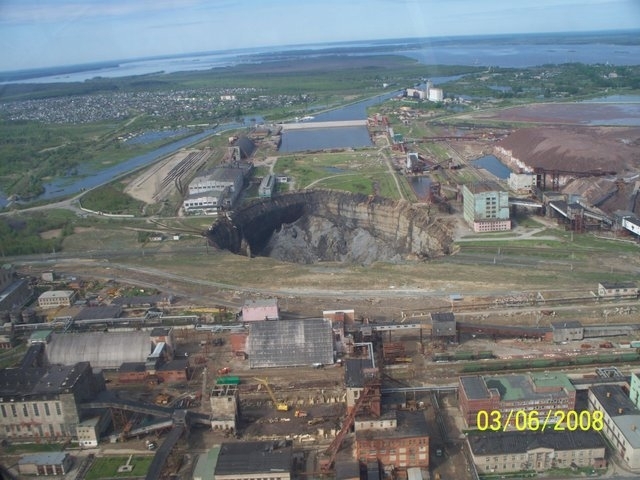 Another caving-in happened not long ago not far from Berezniki station in the Perm region. It’s about 5 meters in diameter but it was enough for the railway car to fall into it. 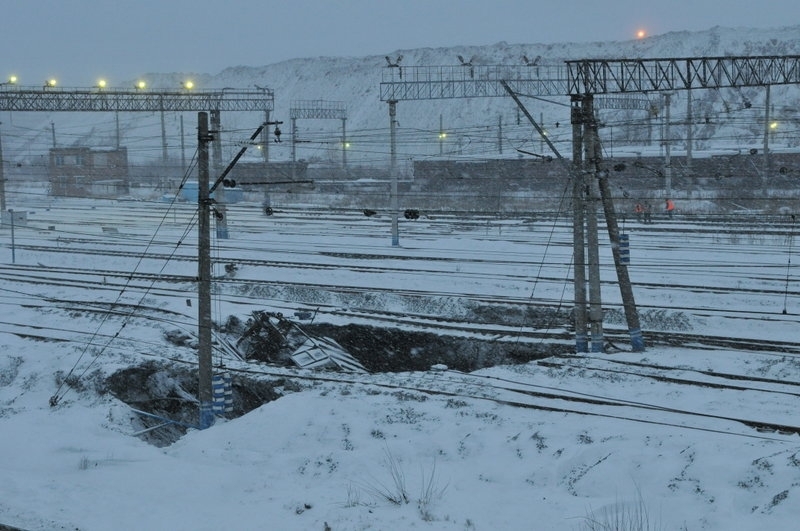 It happened in about 400 meters from the “big” gap, that formed in the summer of 2007 and reached about 50 meters in diameter. 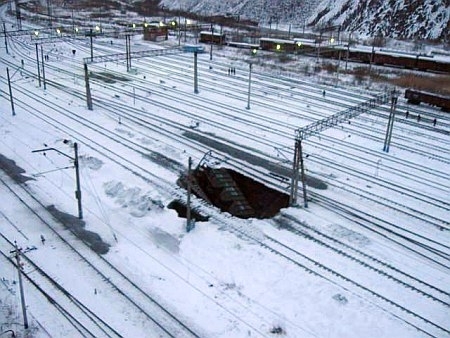 The gap collapsed under the last car of the standing train. It seems that this happens very often lately in different countries over the world, I know for sure in the last weeks happened in Germany and Romania. Romania is a hole so it’s not surprising. Lissen up, Kwis. Youse pinkos couldn’t lokate Romania on a map if it was glowin. Holy moley …. I’ll get my coat. How can this be allowed to happen, it’s surely dangerous. clearly a sign of global warming. I meant to say that Albert Einstein’s equation is that Energy equals the mass multiplied by the speed of light squared in my other comment. I really did know that famous equation E=mc2 for a long time, and I wanted to provide a possible hypothesis concerning one aspect of the Creation of the Universe by God. Perhaps there is no invisible matter that the Scientists cannot see and say is there, but have called it dark matter, because they do not want to call it invisible matter so that people know that they can believe in the invisible realm. Perhaps it is because the Material Universe was made at the Speed of Light from a central point, that prevent the Material Universe from collapsing on itself. Many Scientists have to acknowledge that the Material Universe had a beginning, and many say that it began at a central point. If it is true that the Universe began from a central point and expanded, then if this occurred at the Speed of Light, then it would require a little over 13 billion years to accomplish. I have no problem with how ever old Scientists want to say the Material Universe is, because the Holy Bible does give the age of the Material Universe in my opinion. For the Always Existing and Everlasting Creator, 13 billion years is not a long time. However, if you put one man and one woman on the earth, they will fill it up in only a few thousand years. Starting with the number 2 and doubling it for 33 times, we have a number of 17 billion people. We know that the human race has doubled in the last 60 years, and if we give the doubling rate at a much higher figure of 200 years, we have 33 x 200 = 6,600 years. There are those who say that God has the ability to create the entire Universe and life on earth in six days, and I will not dispute that. However, that does not prove that God created the Universe in 144 hours. After God had waited for all of past eternity, then what was the urgency to create the universe and all life on earth in 144 hours? “Before the mountains were brought forth, or ever you had formed the earth and the world, from everlasting to everlasting you are God” (Psalms 90:2). The Holy Bible informs us God does not change, and this is shown by God’s patience with the evil humans at the time of Noah. However, God is known in the Holy Bible as being a patient God, and God said that He would be patient, and wait for 120 years, and even let Noah build the Ark, when God could had built the Ark in less than a minute. “Then the Lord said, My Spirit will not contend with man forever, for he is mortal; his days will be a hundred and twenty years” (Genesis 6:3). Many people believe that the Holy Bible is silent on the age of the Material Universe, although the Holy Bible definitely does inform us regarding how long humans have been on the earth. I found some very good points on the length of the six days of genesis, and especially the Sixth Day. I have not had sufficient time to consider all the things that were said in the 4 part video series, but I will just say that definitely some of what it says on the age of the Universe, and on the Sixth Day, and its length sounds correct. The video is titled: Age of the Universe: What does the Bible really say? 3/4, and unless it is changed, it is found on the internet at http://www.youtube.com/watch?v=Ip5vVo1dFPo. Billions more think it is nonsense.